Horseplayers are a quirky bunch. This is evidenced by the fact that perhaps one of the most recognizable and respected horse racing personalities out there, amongst those of us in handicapping circles, is not a jockey, owner, trainer, or breeder. No … it’s a hockey player. 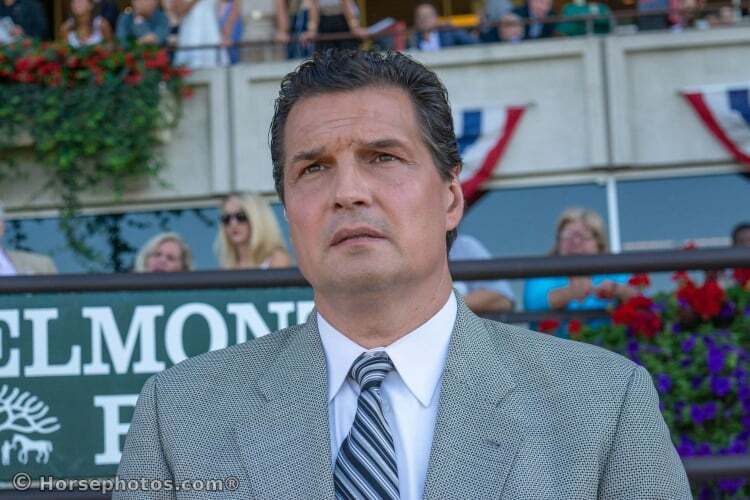 As the calendar turns to fall and the opening of the 2018-19 NHL season quickly approaches, this is a perfect time to give a tournament player’s “tip of the hat” to horseracing’s favorite athlete-turned-television racing analyst and handicapper, Eddie Olczyk. Olczyk is an NHL veteran forward who scored 342 goals during his standout 16-year career as a player for several teams, including the Chicago Blackhawks and the New York Rangers, with whom he won a Stanley Cup in an injury-shortened season in 1994. His day job these days is as color commentator on national television broadcasts of the NHL on NBC, in addition to being the color analyst for the Chicago Blackhawks NBC Sports Chicago and WGN-TV. For horseplayers, however, Olczyk is more often associated with his moonlighting job as a regular host and handicapper for NBC on its horse racing coverage, specifically on big events such as the Triple Crown and Breeders’ Cup. In his “other” job as racing analyst, Olczyk, or “Edzo” as he is often referred to, has successfully won over the hearts and minds of horseplayers and tournament players alike, who are notoriously skeptical of television hosts/handicappers not named Olczyk. Even on his many mainstream sports radio and hockey network TV appearances, Olczyk can often be heard talking horse racing on air, even releasing his top picks when asked the ubiquitous question, “who do you like today?” It is for these reasons and more that Olczyk has been able to garner so many fans and so much respect amongst horse handicappers. As a natural progression from his love of horse playing, Olczyk, 52, eventually found his way into the world of handicapping tournaments a few years ago. Since then, it should be considered a shock to no one that it did not take long for Olczyk to find success as a tournament player. With that approach, Olczyk has begun to make his mark on the handicapping tournament scene. He participated at and played well in the Breeders’ Cup Betting Challenges (BCBC) in both 2016 and 2017, and already has recorded a top 40 finish in that tournament. Those performances were foreshadowing to Edzo’s true coming-out party as a tournament player – his stunning victory in the 2018 Pegasus World Cup Betting Championship on January 27. Olczyk came out on top in that contest with a winning final real-money total of $65,858, thanks in large part to his winning $1,160 Gun Runner-West Coast-Gunnevera trifecta wager in the final race of the contest. Olczyk’s final total was enough to give him roughly a $2,500 margin of victory, which not only secured him the Pegasus tournament’s $137,500 first prize, but also a $10,000 entry into the upcoming 2018 BCBC tournament, and his first-ever qualifying berth into the 2019 National Horseplayers Championship. The fact that Olczyk is in a position to talk about returning for the 2019 Pegasus World Cup is a headline story in its own right. One of the things that made Olcyzk’s 2018 Pegasus win even more compelling was the fact that it was only the second-biggest battle he was involved in at the time of that victory. On August 8, 2017, Olczyk issued a statement announcing that he had been diagnosed with a form of colon cancer. He first sensed something was wrong that July, and was forced to seek medical help instead of going to his scheduled work assignment, the Haskell broadcast for NBC. Three days later, Olczyk was in surgery, where it was discovered that he had stage 3 colon cancer resulting in the removal of 14 inches of colon and several cancerous lymph nodes. The surgery was considered a success, but the procedure and the subsequent six-months of chemotherapy that followed it were debilitating. Olczyk was unable to attend the 2018 Pegasus in person but played and won the Pegasus tournament from home on Xpressbet while in the midst of 12 rounds of chemotherapy. With that kind of success through adversity, it’s easy to see why so many in the horseracing community respect and admire him. While the all-important medical prognosis for Olczyk stands at cautiously optimistic, his relatively insignificant tournament handicapping prognosis looms larger than ever. In addition to qualifying for the NHC and BCBC, Olczyk also is eligible for a $1 million bonus if he goes on to win the BCBC, thanks to his Pegasus contest victory back in February. Winning the BCBC will be a challenge, for sure, but Olczyk has already shown he’s equal to a good challenge.